I’m not exactly the most organised when it comes to cleaning my brushes – I should probably do this weekly or at least every fortnight – but I tend to clean them about once a month. It does help that I have pretty much two sets of brushes, so I tend to use one set then switch to the other – buying me a bit of time between washing sessions. I should probably add here that when it comes to regular washing sessions it’s only the brushes that I put off. Personal hygiene wise I’m a daily shower (sometimes more than one) girl! I used to use Johnson’s Baby Shampoo to wash the brushes but I have recently switched to using Dr Bronner’s Liquid Soap. I received an email explaining the many benefits of the soaps – they can basically be used to clean anything. I have used them before but found them a little bit too drying for my skin but for the make-up brushes they are fantastic. I apply a tiny drop (you really only need a tiny amount) to the larger face brushes and massage into the bristles. All the make-up residue emulsifies and then I rinse them clean – it works a treat. I do only use the tiniest amount though, or else it can be a challenge to rinse all the residue. The other reason I like these liquid soaps is the fact that they come in various scents/ingredients – the tea tree version is ideal for brushes as it has natural anti-bacterial properties so will be good at fighting any dirt/bacteria that has built up – helping to keep my face spot/gross-ness free. I also tried the citrus one, which I like for the smell but the tea-tree is definitely the one I will pick up again. Because only a tiny drop is needed the small bottle will still last a really long time. When a bottle only costs a few pounds (around £3 for 118ml.) that’s a decent price to pay for brush cleaning. Plus I used a bit of the soap to clean the sink after the brush-cleaning session – love a multi-function product. Where do you get them from? I use baby shampoo at the mo but find i have to use quite a lot. They are £4.99 here but that’s for a big bottle which I think will last a really long time! Nice! I like their soaps a lot; very gentle and smell great. I use Aveda’s Shampure to clean mine, which reminds me that I really need to do that today. I’ve always used the MAC one but this looks like it would last a lot longer, thanks! 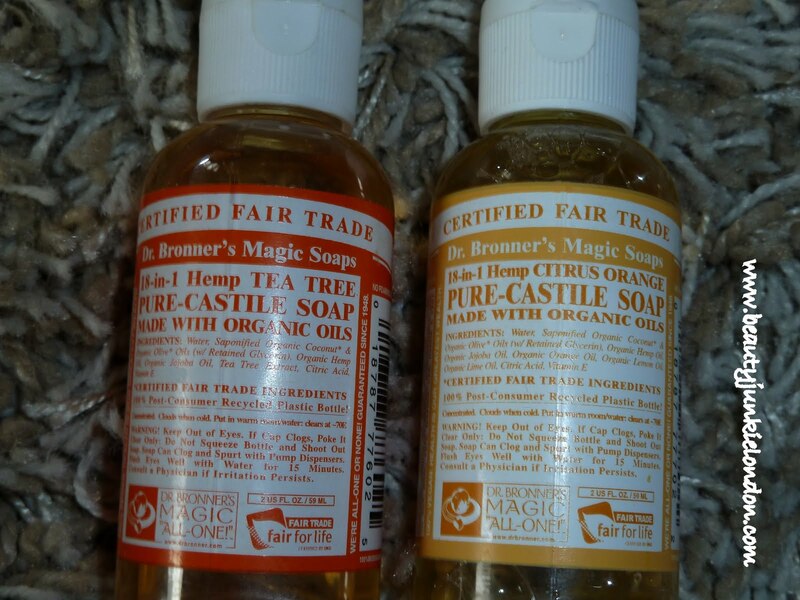 I love Dr Bronner, they are the best ever, especially with 18 uses, you really cant go wrong! Have you tried the Almond on Lemon one. Its beautiful!! !